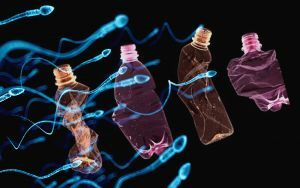 A substance called Bisphenol A can have a negative impact on sperm counts, and it's difficult to avoid. There’s a crisis going on. A crisis of sperm. Specifically, there isn’t enough of it — at least, not enough of the high-quality stuff. Scientists haven’t quite been sure why this is the case, but a new study indicates a possible culprit: a chemical found in plastic. The chemical is one you’ve probably heard of before: Bisphenol A (BPA). It’s been used for decades as a component of plastic takeout containers, water bottles, and the inside of cans. But more recently, researchers have discovered that BPA disrupts the endocrine system. Its presence in the body can do things like cause miscarriages, affect the age at which puberty begins — and, yes, lower sperm counts. That’s a problem because it seems very difficult to avoid BPA. 93 percent of Americans carry BPA in their bodies. And as BPA-laden plastic makes its way from our landfills to waterways, from oceans to the fish we eat, the chemical will surely be found in more places worldwide. A new study, published in the British Medical Journal, shows that BPA might be affecting fertility in people as young as teenagers. In the study, led by researchers at University of Exeter in the U.K., looked at the sperm count of 94 British teens between ages 17 and 19. The participants were told to limit their contact with the substance for a week by using glass or stainless steel food containers, and refraining from eating canned food. Even so, 86 percent of them still had trace amounts of BPA in their systems after the week was up. Participants noted that it was hard to steer clear of BPA because of inconsistent labeling that warned that products might contain the chemical. While this may have had some effect on the results of the study, it reflects the real-world challenge of avoiding the substance in normal circumstances. While research like this raises concerns, the plastics industry maintains that there is no immediate risk posed by BPA. The World Health Organization, the Food and Drug Administration, and the European Food Safety Authority have all previously approved its usage. However, most countries no longer recommend its use in baby bottles, and it was recently added to the European Chemical Agency’s candidate list of substances of very high concern.